Gerard ter Borch specialised in genre painting and portraiture despite his training as a landscape painter in Haarlem with Pieter Molijn in 1634. As a portraitist Ter Borch worked in small formats, depicting his clients full-length, bust-length or three-quarters. 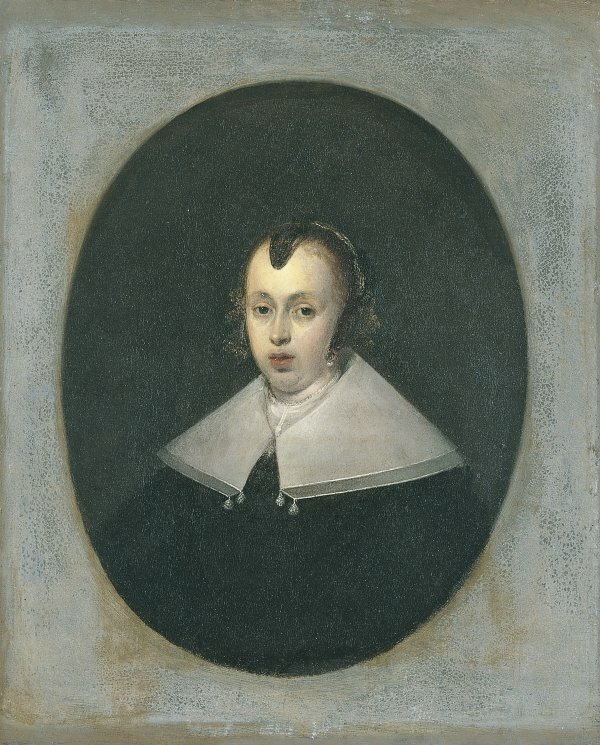 He first used this format, which he appears to have preferred, in the 1640s when he executed one of his most famous works, the Portrait of Helena van der Schalcke, daughter of a preacher, now in the Rijksmuseum, Amsterdam. It deploys certain elements that would become widespread in Ter Borch’s later portraiture such as the simple setting, which in that work consists of a plain background and in other portraits comprises only a few elements of furniture including a table and chair. This austerity relates to the type of sitters depicted, who were members of a middle class that opted for a relatively simple manner of dress and lifestyle. Ter Borch’s painstaking and precise technique is evident in these works in which he carefully modelled the hands and the textiles, both delicately illuminated. The artist’s preference for this format was fully consolidated in 1648 when he painted one of the few scenes of contemporary history to be found in Dutch art: the copper panel of The Swearing of the Ratification of the Treaty of Munster (National Gallery, London). On a small panel, Ter Borch included around 70 figures standing and full-length who form a semi-circle around a table at which the leading dignitaries are seated. The present pair of portraits is dated to 1652, two years prior to the artist’s move to Deventer and after a period in which he is documented in Delft. Using rectangular shaped panels, Ter Borch painted ovals in dark, neutral tones against which the figures stand out. This was a format that he used in the 1640s and 1650s for an important group of portraits that include husband and wife pairs. When he studied these two panels, Gudlaugsson dated them to around 1640 on stylistic grounds. He also noted various pentimenti in the collars of both figures and in the woman’s coif and considered that this indicated that Ter Borch subsequently retouched the paintings, thus explaining the date of 1652 in the background of the male portrait. He suggested that this subsequent alteration may have been due to the artist’s desire to bring the sitter’s clothes into line with fashion at the time. Ivan Gaskell and Emil Bosshard carefully studied these areas and rejected the idea of subsequent re-painting. They detected a different technique in the areas singled out by Gudlaugsson as well as natural wear of the pictorial materials used.